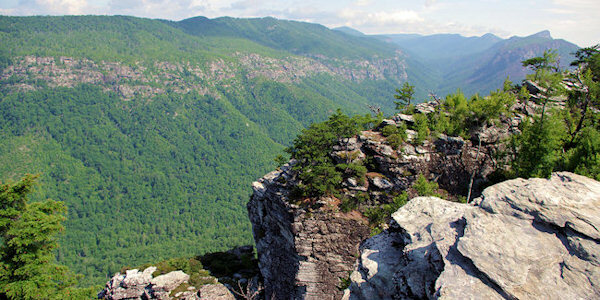 From the top of Shortoff Mountain (elevation 2,883 ft.), soak in some of the most spectacular views in the North Carolina mountains, with sweeping vistas of the Linville Gorge and Lake James. 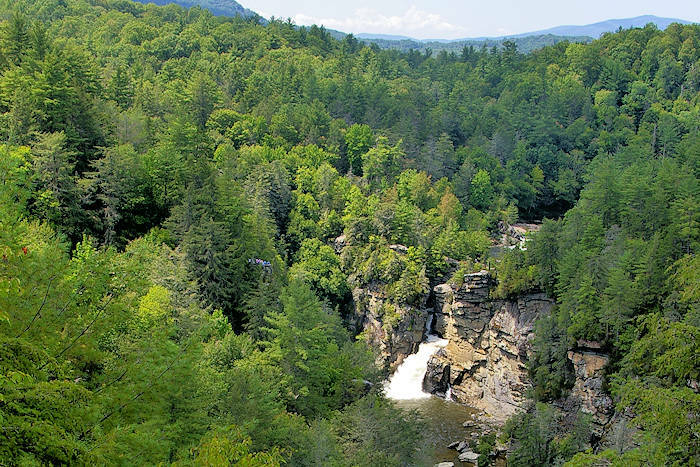 The Linville Gorge Wilderness Area, also known as the Grand Canyon of the East, is one of the wildest, most rugged gorges in the eastern United States. It's outdoor paradise for hikers and backpackers. 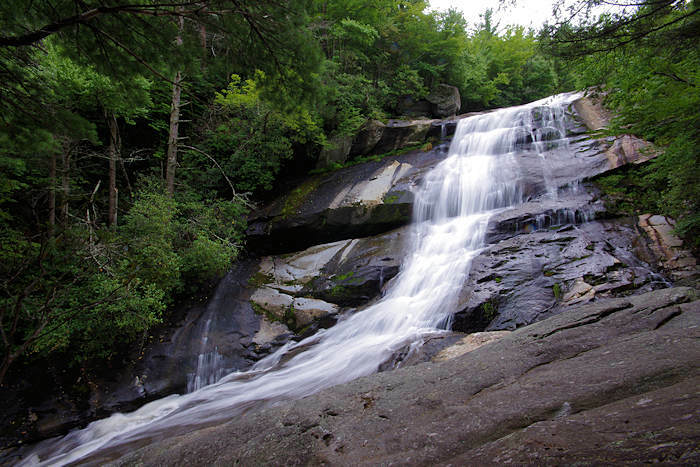 Located in the Shortoff Mountain is near Lake James in Burke County. The 4.5-mile round-trip hike gains 1,321 ft. in elevation. The first mile of the hike is strenuous as you climb the mountain on the rocky trail with switchbacks, but it's safe and easy to follow. The last 1.25 miles is a mostly level trail across the broad summit, with plenty of spots for panoramic views. It's a great option for a winter hike since it's a very sunny hike. 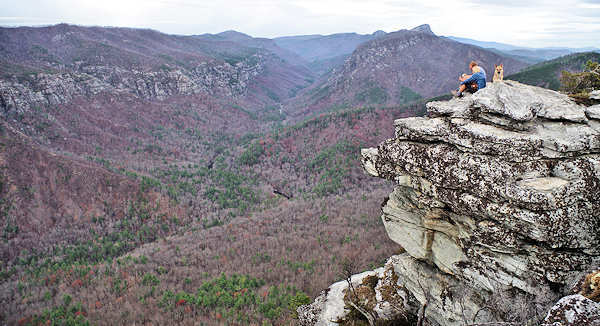 Our other favorite spots in the Linville Gorge include hikes to the top of Table Rock and Hawksbill mountains, the overlook at Wiseman's View and hikes at Linville Falls. Since there were two fires on the mountain (2002 and 2007), much of the hike has open vistas with little tree cover. Many burned tree trunks tower above green brush and wildflowers. Be sure to wear sunscreen and take water! This can be a very hot hike in the summer, especially the first mile of climbing the mountain with little shade. Start early to avoid the heat. 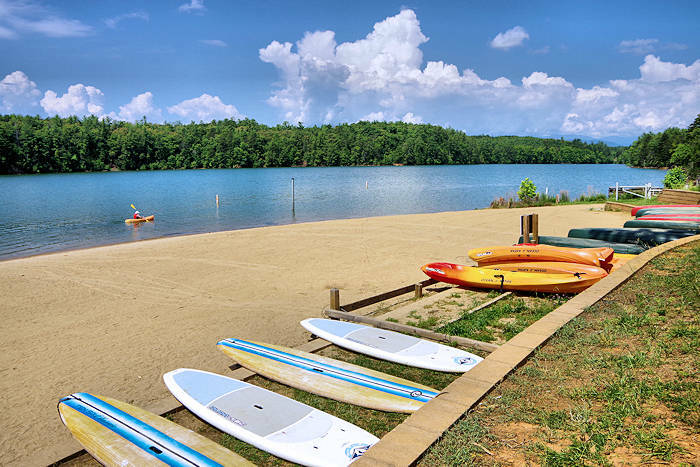 Find drinking water, restrooms and a beach at nearby Lake James State Park. No facilities here. 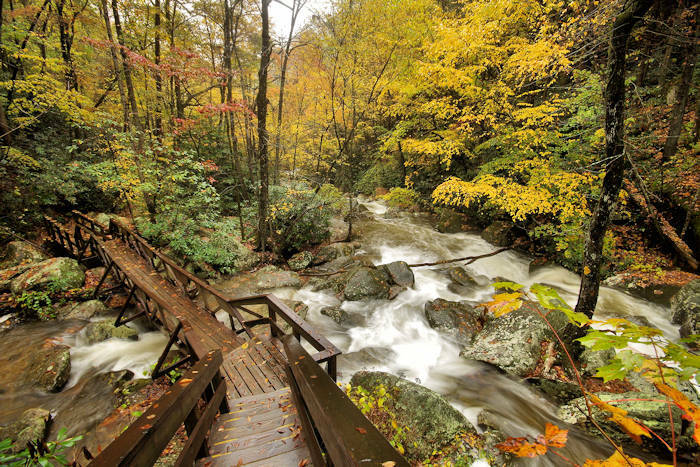 As with many trails in the wilderness areas of Pisgah National Forest, there are no signs for the parking area or the trailhead. But parking is easily found at the end of the road and there's only one trail there. After you hike a few minutes, you will see a homemade sign to turn right to Shortoff. 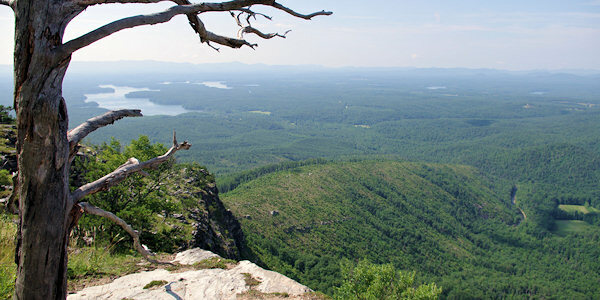 As you climb the mountain, you will see more sweeping views south across Lake James. There are many rock outcroppings along the climb to sit and rest a bit. At about 3/4-mile up the trail, the Mountain to Sea Trail merges with the trail from the left and continues to the base of the Chimneys (5 miles from parking area) and Table Rock (7 miles from parking area). After the Mountain to Sea trail merges, you will see white blazes which will help you hike across the summit. 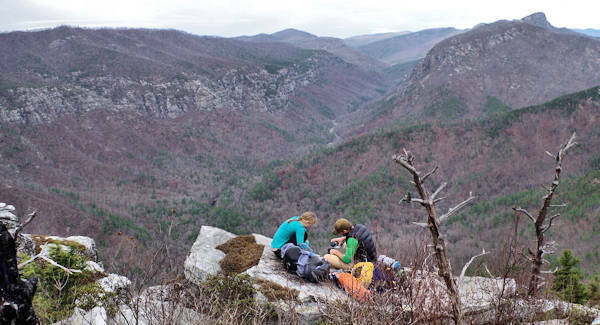 After your first mile of climbing, you will be rewarded with several rock outcroppings with sweeping views that include Lake James and the Linville Gorge (with the Linville River about 1,300 ft. below). The last mile of the hike takes you across the flat plateau summit of Shortoff, through a section of forest that survived the fire and through a big section of an area recovering from the fires. Look for wildflowers and interesting plants along the way. Some of the trail is overgrown, so long pants could be a plus. 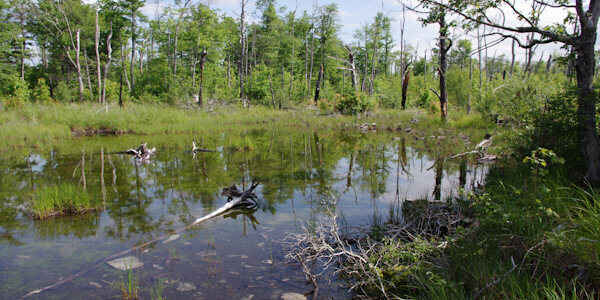 Since you are in a wilderness area, the trails are not maintained and trimmed as they are in other areas. But it's easy to follow (remember to follow the white blazes). Along the way, you will find more outcropping on your left for great views. Pass by a natural pond atop a summit (a rare sight in our mountains) and continue to the last group of rock outcroppings to the left with the best view of Table Rock mountain. This is a prime picnic spot (pic below!). Soak in the views for a while. From there, the trail continues down the mountain toward Table Rock (about 5 miles). To return to the parking area (2.25 miles), simply turn around and retrace your hike. The trail is open year-round. Dogs must be on a leash. You'll see several great areas for camping along the way. 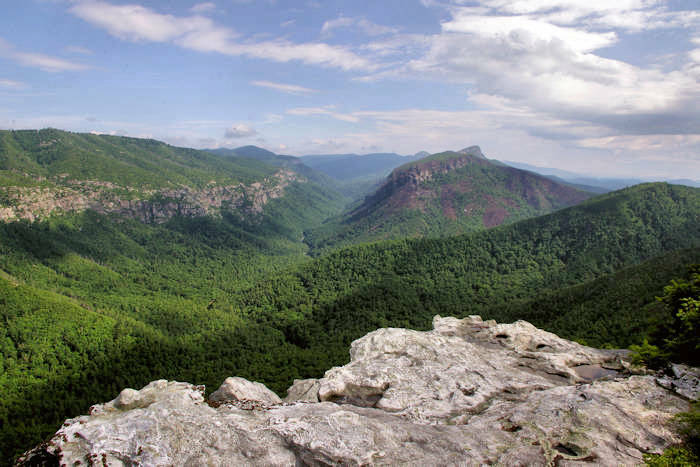 Camping permits are required on weekends and holidays from May 1 through October 31 through the Grandfather Ranger District of Pisgah National Forest (828-652-4841). Group sizes are limited to ten campers or less. Permits are restricted to one stay per group per month, and for no longer than three days and two nights per visit. Please practice no-trace camping. Hunting and fishing are also allowed but also require permits. From Asheville, take I-40 East to Exit 94. Turn left on Dysartsville road and go 7/10-mile. Turn left on US 70 West and go 1.7 miles. Turn right on Bridgewater Rd and go 1.3 miles (toward Lake James State Park). Turn left on Benfields Landing Road and go 2.2 miles by Lake James. Turn right on NC 126 East and go 6.6 miles to Wolf Pit Road on left. Turn left on the unpaved Wolf Pit road and go 2.5 miles to the end with parking at the turnaround. You'll pass the "legendary Wolf Pit Weather Rock" along the way!